Aloha! We’re back with another update — and actual things are happening… good and bad lol! Let’s jump in, shall we? 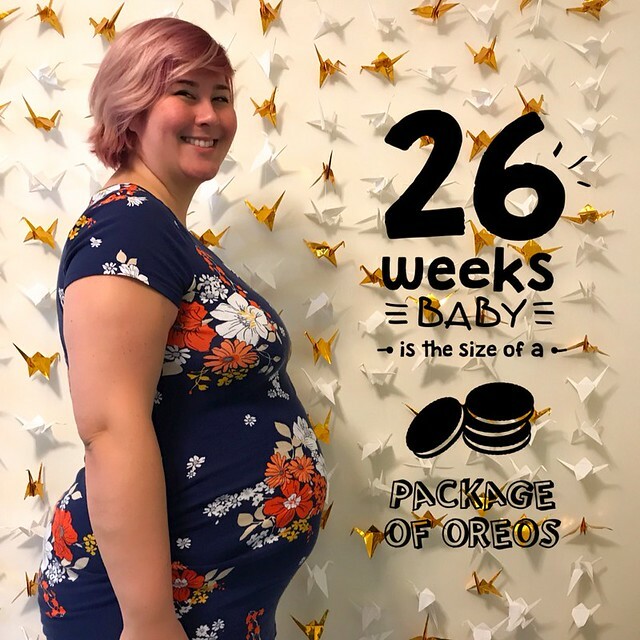 Foxlet’s Size: Foxlet’s just under 2 pounds and about the size of a head of lettuce or package of Oreos. Weight Gained: My scale ran out of batteries and apparently I have like 6 boxes of AA batteries but nary a single AAA battery in my house, so I’m not really sure where I’m at this week. But I think I might’ve gained another pound or so, which would bring me back up to to -5 lbs from my pre-pregnancy weight. Symptoms: Eh, heartburn, insomnia, SPD, general uncomfortableness… there’s not a whole lot of new stuff going on with me physically. Just some more unfortunate-but-normal stuff, which seems to be pretty much par for the course with me. I’m also already deep into nesting mode — my baby shower isn’t for another few weeks, but I haven’t been able to help myself from starting to set up a few things already. Which, I know, is kind of silly because I still have months to go, but I can’t help it! Nesting! The nesting is real! Luckily, we don’t really use that one side of the closet that much anyway — it mainly houses Sean’s and my fancier clothing — suits and cocktail dresses and whatnot. 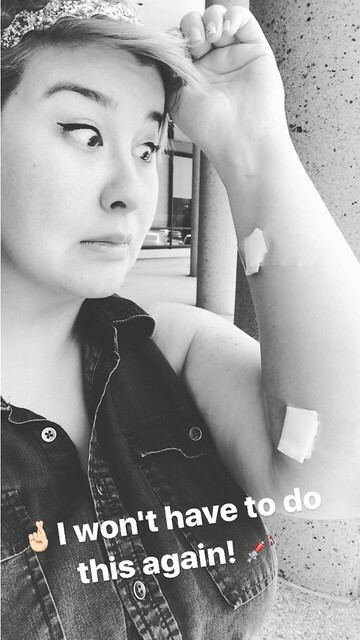 …and I failed with a blood sugar level of 146 (my OB office’s cutoff is 135). Womp wompity womp. If my blood sugar is elevated outside of the normal range for 2 of the 3 blood draws, I get officially diagnosed with gestational diabetes. Which means I’ll have to go see an endocrinologist and follow a special diet and have to do those finger prick things and maybe even potentially have to give myself insulin shots! Buuuuuuuut, before I spin out of control (again), I just need to remember that those are all attached to a big “if” at this point. So for now, I’m going to try to remain hopeful that I’m in the 20-plus percent of women that will go on to pass my 3-hour, and if I do end up having GD, I’ll cross that bridge then. After all, Foxlet’s health is obviously the most important thing here, so of course if those things need to happen, they’re gonna happen. But it doesn’t mean I’m gonna be happy about any of it, lol. Cravings/Aversions: Been craving lots of sweet things — fruit, desserts, bubble tea. Maybe it’s my mind telling me to get in my sugars while I can, just in case I do end up having to go on a stricter diet, lol. No real aversions right now though, so continued yays there! Sleep: Sleep is a tricky thing. When I do finally fall asleep, I think I sleep pretty hard. But the actual falling asleep part is really hard. I get uncomfortable staying in one position for too long, but sometimes it hurts to change positions while lying down because of my aforementioned SPD. Plus, my acid reflux means sometimes I need to be laying kind of upright so as not to aggravate my esophagus. I continue to be very grateful that I work from home and don’t have to adhere to a super early alarm clock. Purchases: I went ahead and ordered a Nanit baby monitor — they’re backordered until August, so I figured I’d go ahead and bite the bullet now. Calling itself the “Tesla of baby monitors,” this monitor is supposed to provide a great quality picture, secure access via your phone, includes temperature + humidity sensors, a special night light that’s not supposed to wake the baby when you go check on her, and white noise/nature sounds functionality as well. Plus, the “Nanit Insights” feature (an extra subscription) stores video from throughout the night and even compiles a little highlight video for you each morning so you can check on how well the baby did the night before. It has a bunch of sleep analysis features as well that are supposed to let you know how well your baby slept, and help you figure out sleep improvements and whatnot. Which, eh, I’m mildly skeptical of how accurate/scientific that part of it all is, but I’m sure it’ll still be fun and interesting for us, haha. 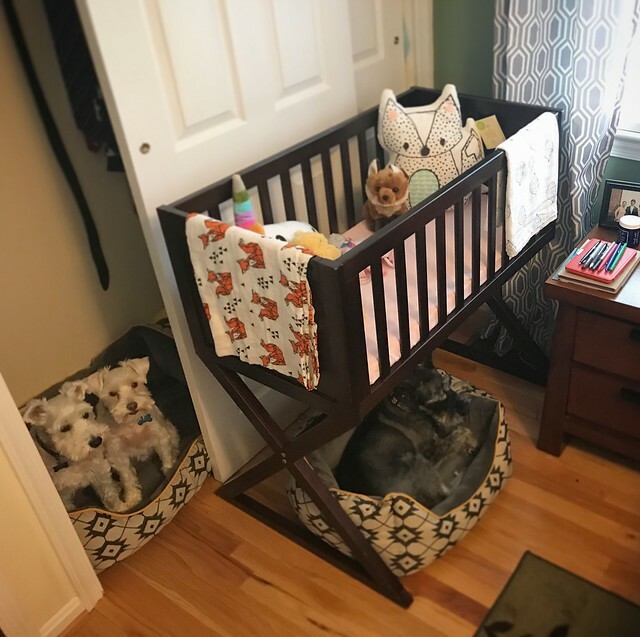 I was also lucky to receive a couple more baby gifts this week, so in addition to getting her bassinet set up in our own bedroom, I have wasted no time starting to get Foxlet’s room in order as well. Sean’s parents very generously gifted us with our crib and mattress, and I just couldn’t keep myself from setting it up! Man, talk about making this whole thing feel real! A crib feels VERY REAL, let me tell you. 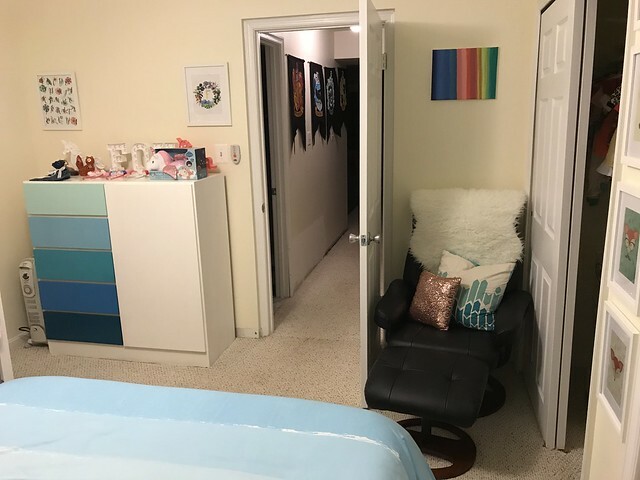 It’s taking a bit of time to figure out how everything’s going to work in her room, as our house only has two bedrooms, so her room is also our guestroom. So it was already full of furniture that I’m trying to repurpose for the baby as best I can. The main thing is trying to work around the bed, which I’m reluctant to get rid of because I think it’s sure to come in handy after she’s born — whether for actual guests or just for me, haha. So setting up her room is involving a lot of trial-and-error, shifting things around, and just seeing where things fit (or don’t.) For example, in order to fit the crib in there at all, we have to push the bed pretty far over to one side (it used to be centered in between the two windows). It’s not ideal, but I think it kinda works? I’ll be playing with the layout of everything a lot more, so I guess we’ll see how it all ends up. So there are still tons of changes to come, of course, along with swapping out a bunch of the current decor, adding new stuff, and performing a general girlification of the room, hehe. But consider this your very first peek at what Foxlet’s nursery will be like! 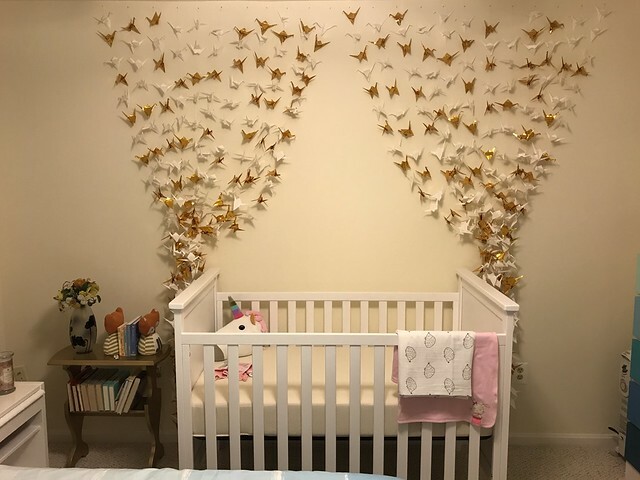 I also haven’t decided if I like the cranes pulled to the side like curtains (how it is pictured above), or if I want to cut some of the strands so they all hang straight down (the way they used to), but in a way that kinda forms an arch over/around the crib. It’s probably kind of hard to visualize, but… thoughts? If I leave it as it is now, I’ll definitely be putting a decal or some artwork or something on the wall in the middle. In other news: I’ve put together a rough birth plan document and pre-registered at the hospital (for anyone who’s familiar with the local hospital system, I’ll be delivering at INOVA Fairfax), and am now looking into birth classes for Sean and me to take. Although, I have heard some mixed things about taking birth classes. Some friends say they really loved theirs and thought it was really valuable, and some have said it didn’t really provide any new information and was kind of a waste of time/money. As someone who is neurotic Google-happy watches a lot of medical tv shows prone to doing tons of research and self-education anyway, I am wondering if I’ll fall into the latter category. I mean, I’ve already read through like 3 baby books, am constantly perusing the BabyCenter forums, and am listening to the Pregnancy Podcast every night before bed soooooo… lol. Anyway, that certainly catches us up (and then some!) to what’s been going on lately. See you in week 27! 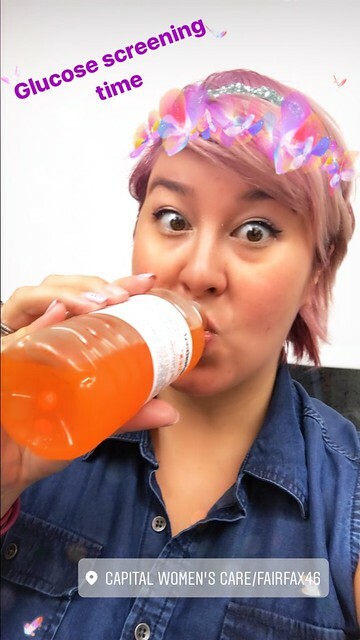 Long time reader, first time commenter….with my second kiddo I failed the 1 hour glucose test (with a 137) and my doctor just let me retake the 1 hour test, which I passed just fine. I had eaten a sandwich and pretzels for lunch the day of my 1 hour the first time and I really think that was the issue. I’d float just retaking the one hour with your doctor and then just be really cognizant of what you eat before the test. Just my two cents! Good luck with whatever you do! I didn’t even think that would be a possibility — I’ll have to inquire about that! Although my test was earlier in the day so I didn’t really eat anything beforehand, so not sure if my results would be any different. I did have some fruit the night before though… hmm. I loved the birth classes I took with Jason. I scheduled them all about 2-3 months before due date when I wasn’t too far along where it was too tiring to get to them. I found them all helpful (some more than others), the ones I loved the most was the childbirth class. It was a condensed version of their 5 week long course into one 5-hr session on the weekend. I read all the books already but it was nice hearing what the hospital protocol was on rooming in, skin-to-skin and delayed cord clamping. My hospital was extremely baby friendly so I got the birth experience I was hoping for with knowledge that there was a NICU and surgery room on standby if anything went awry. The other classes I found helpful were infant CPR/child safety and breastfeeding. The only class that we honestly could have skipped was basic newborn care since I was comfortable around babies and read everything. A lot of what they covered were common sense things (how to swaddle, how to hold the baby, how to dress a baby…et). Congratulations again! The nursery looks beautiful! I loved our birthing class, as you know, and I think it really benefited Jim as well! Sorry to hear about the glucose test, fingers crossed for the next one! The birthing classes aren’t just for you, they’re also for Sean, so just because your comfort level is high doesn’t mean his is. My ex and I took three classes during the week (an Infant CPR and Safety class, a Newborn Basics class, and a Preparation for Breastfeeding class), and then did a big one day shebang at the hospital on a Saturday which was more about labor and delivery, a tour of the hospital, etc. We thought they were all extremely beneficial, especially since I’m an only child and hadn’t been around babies much, and my ex hadn’t either. I didn’t feel I need the birth class for myself. I too felt prepared, knowledgeable and knew what to expect. But my hubby doesn’t get experience what we do, so it was great for him. We just did a day session that wasn’t more than a few hours. But it was good for him to know, and hear from someone besides me, what to expect in the room and what I expected of him. It was also a good bonding time and got in tuned together. We only did it with our first. 100% recommend a good birth class. we did one with a lot of lamaze breathing techniques, and it made my husband so comfortable in the delivery room. it wasn’t a ton of new info, but it was presented in a way that made us both on the same page, and the staff actually commented on how smooth our birth was because my husband knew what to do and what was going on/what Qs to ask during the birth, esp when there were complications and he didn’t get freaked out. it honestly helped us avoid a c/s because we had practiced breathing and were able to push and get the baby out safely. it helped him be an awesome coach! I found the pain management and labor sections of our birthing class extremely helpful, but we already had a really good instructor who worked to make the class engaging and interactive. I think they makes a huge difference. As someone who’s actual birth story contained 0% of my “ideal” birth plan (well except for delivering at my chosen hospital), I would say don’t get too bogged down in your birth plan. 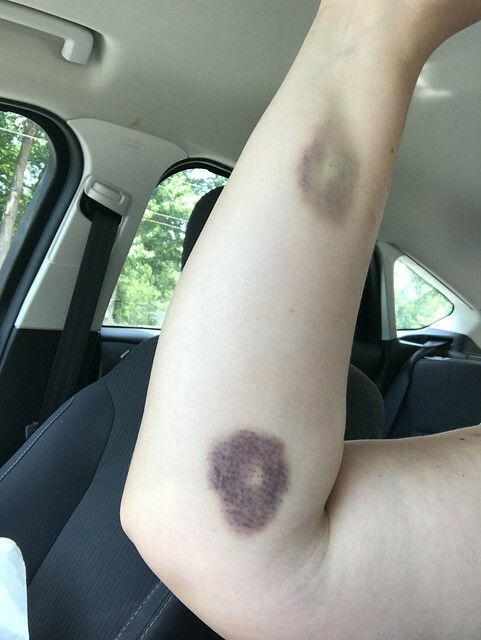 I went in wanting to do an unmedicated vaginal birth, but due to preeclampsia and a stubborn baby who would not flip, I came out with a very medicated (steroids for her since I had to deliver slightly preterm, drugs for the preeclampsia and a spinal block) c-section and no idea what it even feels like to be in labor. Obviously everyone is different and what worked for me doesn’t work for everyone else, but for me my birth plan was simply “me and the baby are both alive at the end of it all,” and then I had that “ideal way if getting there plan” (the unmedicated, vaginal birth) but if my body or the baby had other plans, I was going to do what needed to be done. 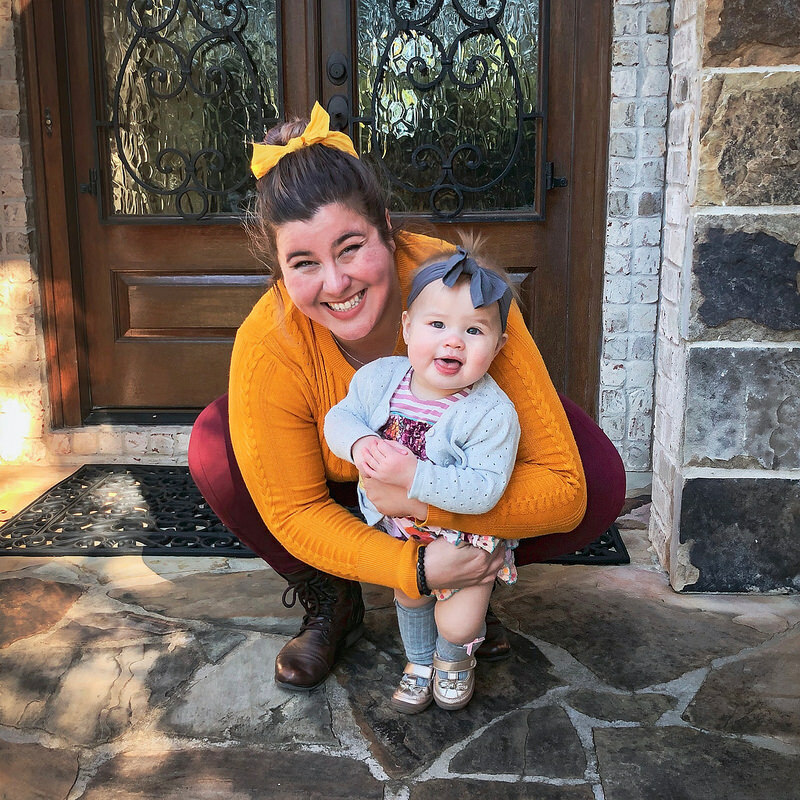 I had gestational diabetes in my firstc (and only) pregnancy. 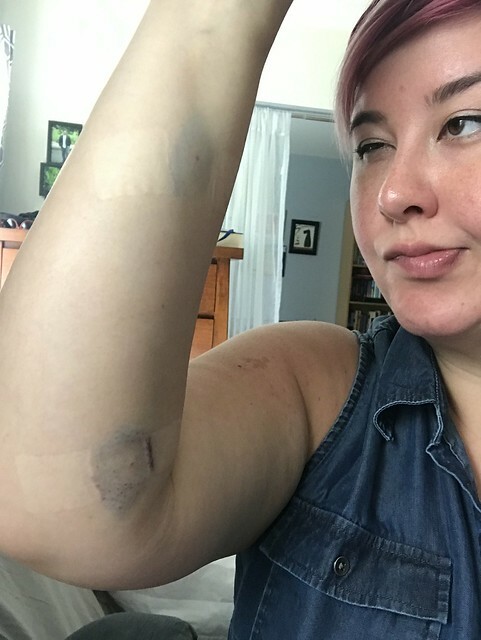 I had the world’s worst pregnancy (started off with hyperemeisis gravidarum which sucked but then went into preterm labor at 21 weeks, had to get a cerclage, was put on bedrest in hospital for 50 days until I delivered at 29 weeks). Gestational diabetes was really the last straw and I lost it. But good news! I controlled it with diet alone! I was very very strict with what I ate though and times I ate (it was awful add I was still vomiting at that point). I never breeder insulin and got to go down to checking my blood sugar only twice a day bc my numbers were so good. Also my 1 hour screening number was 218! I didn’t Eben do the three hour test they just diagnosed me then. Theyv say with gestational diabetes you very rarely need insulin. I was slim to begin with and bc I was so sick only gained 5 pounds total during pregnancy. I actively had to gain weight after I delivered in order to make milk for my preemie babe. She’s 6 months now, currently 18 pounds and very healthy! Needed insulin not breeder. Typing one handed as my daughter is asleep in my arms. Oh my goodness, Liza, I’m SO glad to hear that both you and your daughter is doing well after having to go through all of that! Definitely puts any potential GD I might be dealing with into perspective, that’s for sure. Although it is good to know you never needed to do the shots — I think that’s the part I would dread the most! I think the birthing classes are so helpful. We did a couple of the labor/hospital tour classes and then I did the breastfeeding class. I think they were great, if only to make sure my husband and i felt comfortable with our plan and the various options that might have to happen (and did happen). We ended up doing an infant cpr class after our daughter was born because she was a month early and we missed the scheduled class. Good luck! One great exercise we did was going through a birth plan and then going through the opposite of all our choices to help us prepare for what might happen. That was so helpful since none of my labor and birth goals were realized beyond the fact that Tiberius and I came out of it health and happy. It’s fun to read your updates. You’re doing great. Louise you are my girl then! Teach me your sleeping ways. But for real! Now, after disappointing you, of all the books I read, ONE was helpful. I will find it when I get home tonight and post the title and author here. Again, it didn’t “fix” me or my son, but it helped and I felt saner afterwards. I think a birth class is a good idea although far from exhaustive. I feel I would have benefited from more information/instruction on breastfeeding and how to troubleshoot. I’ve had 2 tongue tied babies now and we paid for a laser revision for both of them. Totally changed how they nursed and made it possible without pain! I love the cranes as curtains actually! Very clever and classy. I took The Bradley method class. I know it may not be your plan to do an unmedicated birth but the awesome thing about this is teaching Sean to be your birthing coach and preparing him to understand the birth process. Best of luck!! Hey! I found the breastfeeding prep helpful in my birthing class and not much else. Especially pumping schedules with return to work. I was astonished how quickly I threw out my well researched and overly thought out birth plan. Once I was in labor, I just got caught up in the moment and forgot all about it. I love the cranes, your whole nursery is beautiful. I just want to well-intentionally point out that once baby foxlet is pulling to stand in her crib and can reach those and pull them down, they become a strangulation hazard. Sorry, Karen killjoy is at it again! But I felt compelled to say there could be a safety issue there. Haha, no worries, I’m definitely well aware! But I figured since I’ve got at least a year before that happens, I can enjoy the aesthetics for now and then readjust and redecorate later (which I’ll probably want to do anyway, lol). 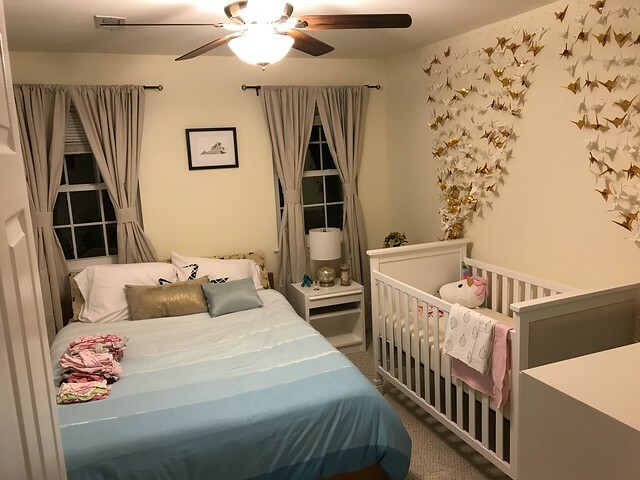 The nursery looks super cute! Where did you get the bassinet? Hoping everything goes well with your next glucose screening, and even if you do have GD I know plenty of women who have also had it and have managed it through diet, and they (and their babies) turned out great in the end! The bassinet brand is Babyletto but I got it secondhand on Facebook Marketplace for like $30!